Albatross D-III Special Hobby 32008 Planned issue for 2006. Albatross D-III Roden 606 Planned issue for 2006. Albatross D-III Batte Axe 3204 Contains resin and photo etchings. Bachem Ba 349 Eagle Knight 7 VAC Form Batter. Bücker Jungmeister Marco Miniatures Beverly Howard's aircraft. Bücker Bü 131B Jungmann Planet 8732 Basic biplane trainer. In resin. Bücker Bü 133 Jungmeister Planet 8532 Aerobatic biplane, single seat reengined version of the Jungmann. In resin. Bücker Bü 181A Bestmann Planet 8432 Basic trainer, also used as liaison and towing aircraft. In resin. Bölkov Bk-117 Revell 6325 ADAC rescue Helicopter. Bölkov Bo-105 Revell 4416 / 04453 / 4473 Helitow Combat helicopter. 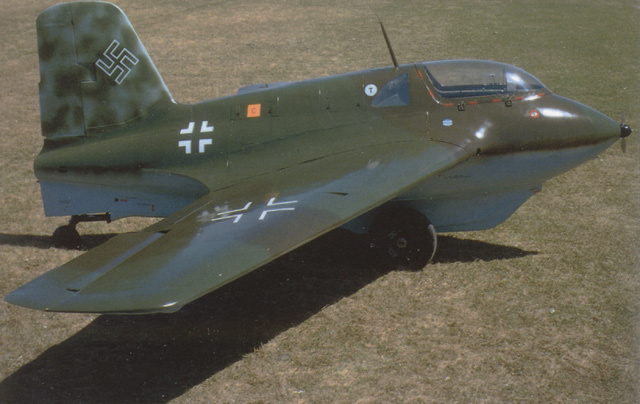 Dornier Do 335 ? ? VAC Form Pfeil with choice of single seat or two seat. Includes two engines, wheels etc. See picture of the kit curtesey of Andreas Krause. Eurocopter EC-135 Revell 04423 / 04425 / 04465 Air Zematt rescue Helicopter 4423), ADAC rescue Helicopter (4425)Heer Hlicopter (4465) Basicly the same kit but with diferent decals and possily acessories. Eurocopter EC-145 Revell 04481 / 04492 ADAC Security helicopter (4481) REGA Rescue helicopter (4492). Fiesler Fi-103 (V-1) Accurate Armour 1:35 With launching ramp (which is to short due to space). Extra length ramp parts is available as a sepperate kit. Fiesler Fi 156C Revell 04714 Reissue of the Hasegawa kit. Focke Wulf FW 190 A5/A6/A8 Hasegawa 8056 / ST06 / S010 /S021 / S023 I have a kit and find it a good kit, mine's a bit warped though. There's choice of different armaments and gun cowers. Also includes a nice engine. This kit is marketed as several versions in different boxes. Focke Wulf FW 190 A5 Hasegawa 08073 A new tool kit, kit 8071 and 8073 shares most parts. Engine, exterior and cockpit is far better than the old issue. Focke Wulf FW 190 A6 Hasegawa - A new tool kit, shares most parts with kit 8071 and 8073. Engine, exterior and cockpit is far better than the old issue. With decals as Checkernose. Focke Wulf FW 190 A6 Hasegawa 8172 Decals for Heinz Bär. Focke Wulf FW 190 A8 Hasegawa 08071 A new tool kit, kit 8071 and 8073 shares most parts. Engine, exterior and cockpit is far better than the old issue. Focke Wulf FW 190 F8 Hasegawa 8130 Reissue of the old A series with new canopy and underwing stores. Focke Wulf FW 190 F8 Hasegawa 8151 Is a completly new kit, using parts from the new issue A and D series. Focke Wulf FW 190 F8 Revell 04716 It's a reissue of the old Hasegawa A with a new canopy and extra bombs. Focke Wulf FW 190 D-9 Revell H215 / 4775 I have a couple of kits and they're nice ones, not as many choices as the one above, but it is better than the one below. Contains a reasonable engine. Colour scheme from Papagai staffel that's very colorful, and the decals for this is better (in my opinion) than Hasegawa's try for the same staffel. Focke Wulf FW 190 D-9 Revell 4725 A Revell release of the new Hasegawa moulding with changed decals. I have a copy of this nice kit, there's not one part in common with the earlier Hasegawa kit, nicely engraved details and not the raised rivets of the old kit. It has options for either original style or blown hood canopies, and also a choice of new or old tail. Focke Wulf FW 190 D-9 Hasegawa 51012 / 8120 This kit is definitely not worth the price in my opinion! The kit includes many white metal parts and photo etchings, but the fuselage is with engraved panel lines and the rest with raised rivets. There's no engine or possibility of opening the front, the fuselage is empty from the (Also missing) firewall and forward. Focke Wulf FW 190 D-9 Hasegawa ST 19 / 08069 / 08143 / 8155 A completely new issue of this plane. I haven't had the chance of looking into the box, but rewievs are pretty good. Supposedly no parts are identical to the old version. In the same way as their new Bf 109 the tail is seperate, and gives the option of other versions - dream of a TA-152? I have the Revell issue of this kit see above. 8155 is with markings for Barkhorn. Focke Wulf TA 154 ID Models VAC Form "Mosquito"
Fokker Dr.I Roden 601 Apparantly a reissue of the Hobbycraft, but I'm not sure. Looks like a nice kit in he box. Decals for four planes including Richthofen, Udet and Kempf. Fokker D.VII Battleaxe 3201 Limited edition with photo echings. Markings for Theodor Osterkamp and Richard Wenzl. Fokker D.VIII Battleaxe 3203 Limited edition with photo echings. Markings for Berthold and Fridrichs. Fokker E.III Battleaxe 3202 Injection moulded with resin engineand photo echings for details. Includes decals for Ernst Udet and one more aircraft. Fokker E.III Sram 3201 An unknown company for me. Hansa Brandeburg W.20 Omega Models 32001 Resin kit of Biplane flyingboat. Heinkel He 162 Revell 04723 Salamander, or Volksjäger. A very nice kit as one can expect in 2004. Decals for three planes. Heinkel He 219 Combat Models 32-008 VAC Form "Uhu" Night Fighter. Heinkel He 219 ID Models VAC Form "Uhu" Night Fighter. Junkers Ju 87B/R 21st Century Toys - Stuka . Junkers Ju 87B Revell 4661 /4751/4796 Stuka issued by a company that also supplies painted assembled models. Fairly nice kit, but with rough details as older kits and is prepared for assembly with screws, but at a low price a good buy. Parts are seperate and comes in small plasticbags. Junkers Ju 87D Hasegawa 08076 / ST26 A Late war Stuka, shares most parts with the G version that ws issued first. Mainly weapons and decals are diffrent..
Junkers Ju 87D-8 Nightfighter Hasegawa 08071 Panned release 2006..
Junkers Ju 87G Kanonenvogel Hasegawa 08075 / ST25 A late war Stuka. A much more detailed kit, than the older Revell kit,but luckily not the same version. Includes both standard and long wingtips. This version includes the big 37mm ant tank guns and gondolas. The initial issue includes metal figures of Rudel and his german sheppard in white metal. - LS8a Glider Revell 04353 New issue 2006. Competition and tour Glider from 1993. Messerschmitt Bf 109 E Matchbox 40502 / PK502 A nice kit, and both mine seems to fit nicely, there's a lot of interior details and a nice engine. The clear parts are a little on the heavy side. Includes decals for Galland's fighter and one from the Richthofen Staffel as well as a Croatian one. Messerschmitt Bf 109 E Hasegawa 8051 / ST01 Nice kit, with a choice of both early and later armoures canopy, seems to fit well and the engraved detail looks a little better than on the Matchbox version, just as the clear parts are better. 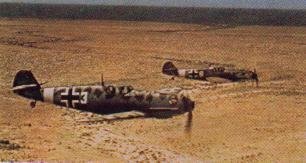 Depending on issue there may be decals for Galland, White 3 from JG 27 in the dessert and several other choices. Messerschmitt Bf 109 F Revell A nice kit in usual Revell style with raised details. Decals for Eric Hartmann's plane. Same kit as "G-6" (4772) below, but without the frame with the gunbreach covers. Messerschmitt Bf 109 F-2/F-4 21st Century Toys 22103 Messerschmitt 109 issued by a company that also supplies painted assembled models. Fairly nice kit, but with rough details as older kits and is prepared for assembly with screws, but at a low price a good buy. Parts are seperate and comes in small plasticbags. Messerschmitt Bf 109 F to H Combat models A kit that covers quite a few versions of the Bf 109. See a couple of pictures. Messerschmitt Bf 109 G4 Hasegawa 8135 / 8148 / 8170 8135 is Hartmanns plane, 8148 has decals for Italian planes and 8170 for JG 27. This kit is a version of their ST 17 kit. Messerschmitt Bf 109 G4 trop Revell 04721 / RM5981 Another new Revell issue from their cooperation with Hasegawa. This kit is a version of their ST 17 kit. Messerschmitt Bf 109 G6 Revell 4772 In my opinion a fairly decent kit, I just got one, and it seems normal Revell standard, raised details and so on. Convertion to late "F" and other early "G" versions seems easy, the gun fairing bulges for the G-6 is seperate. Nice decals for one WW II and one german 1986 maschine. Opinion is that it's too short in the fuselage and mine is shorter than both Revell and Matchbox "E" versions and the newer Hasegawa G's. A new kit from Hasegawa, a very nice kit, nicely engraved panellines and a good configuration of parts. Choice between several different versions of armament and cowls. The kit has a seperate tail unit giving the possibility of other versions, the only "but" is that because of this, you'll need to remove four engraved panels high up on the back of the fuselage that isn't there on G-6's but on later version G/K. 8153 is with decals for "Super Experten" and 8142 for "Eyeball"
Messerschmitt Bf 109 G10 Hasegawa ST 022 / 08157 Another new kit from Hasegawa, most parts are shared with their new G-6 (ST 17). The same four panels as on the G-6 also has to be filled/removed. Messerschmitt Bf 109 G14 Hasegawa ST 18 / 08068 Another new kit from Hasegawa, most parts are shared with their new G-6 (ST 17), but has the later tall wooden fin assembly. The same four panels as on the G-6 also has to be filled/removed. Also has the late ERLA Haube (Galland Hood) instead of early canopies. Messerschmitt Bf 109 K-4 Hasegawa 08070 / ST 020 Yet another version of Hasegawa's new series of Bf 109 modeles. Messerschmitt Bf 109 K-4 Revell 4702 Yet another version of Hasegawa's new series of Bf 109 modeles. Messerschmitt Bf 109K and late G's CraftWorks 32109 Resin, whitemetal and photoechings. Available spring 99. Messerschmitt Bf 109K Gerald Rutmann VAC, 71 Resin Parts, 3 Metals Parts, Photo Etch, Decals. Messerschmitt Bf 110-C4B Revell 4771 Receives a fair to medium review, but as it's the basis for the next kit, I think I can allow myself to believe that it's a reasonable kit. Messerschmitt Bf 110-G4 Revell H250 / 4745 / 4773 One of my samples fit nicely together, the major problem in this kit is a little heavy clear parts and antennas for the radar. As a novelty to me Revell has included both engines in this kit, something that unfortunately isn't common practice when talking of inline engines with closed cowls. All in all a very "buildable" kit, but with room for improvements and extra details. The engine nacelles are not quite right for a G-4, but modification should be possible. Basicly the same kit as the one above, but the nacelles aren't quite right for a "C" either. Messerschmitt Me 163B Hasegawa 8004/S4 A very nice little kit, because of the small size and the rather unusual engine, it doesn't include an awful lot of parts, but those that are there fits nicely together. The internal armoured windscreen is included. The major problem with this kit is in my opinion that Hasegawa tries to get the rear side of the flying surfaces so thin that it's correct. To achieve this they unfortunately often divides flaps and ailerons along the middle on the lower side. It would have been nicer to have them as sepperate units, or at least the split in the hinge line, otherwise it fit isn't perfect you have to use filler on a fabric surface. Anyway this kit is probably hard to find as it hasn't been reissued recently. Messerschmitt Me 262A Hasegawa 8014 "Storm Vogel". Just got my hands on one and it's a beauty in many ways, theres a nice detailed cockpit and gunbay, even the bottom of the preassure cabin is there, so that when wieved trough the wheelweels it's visible. Two nice engines are also included. Decals for four different machines (Mine's not to good though) and a choice of underwing rockets or underfuselage bombs. Delicate raised details, only slight detail I noticed and didn't like was the flare dispencers. Messerschmitt Me 262A Hasegawa 08168 Markings for Adolf Galland. Ifit's a reelease or a whole ne kit I haven't found out yet. Messerschmitt Me 262A-1a Revell RJ0218 /4473 I don't find the critical reviews of this kit completely fair, it builds into a nice model and in my opinion it has the real "Look" of this amazing fighter. The level of detail isn't as good as in many newer kits, but Eduard has made no less than two detailing kit for this model, one interior and one exterior. They can add many fine details, but takes some getting used to. The kit wheel Wells and cockpit are somewhat bare compared to newer kits. Messerschmitt Me 262A-1a Trumpeter 2235 Again a very nice kit, the model has seperate flying surfaces and lots of detail. And so far it seems that the price is very competitive. The engine gondolas are included in both clear and grey plastic. Messerschmitt Me 262A-2a Trumpeter 2236 Planned releae of a different subversion of the Me 262A-1a above. Messerschmitt Me 262A-1/U4 Revell 4757 This is a reissue of the kit above, but includes an extra frame wit parts for either a reconnaissance version or a prototype "Kanonen Vogel" with a 50mm gun (it actually flew). Messerschmitt Me 262B Hasegawa As for the Hasegawa "A" version the reviews are fine, but it's a difficult kit to get your hands on. Messerschmitt Me 262B-1a/u1 Hasegawa Hi-Tech - High price. Possibly with the same type of faults as the Fw-190 D-9, but I haven't actually seen this kit. Messerschmitt Me 262B-1a/u1 Revell 4777 The reviews are better than for the "A" version, I don't really find them so different, but the interior is a little spartan and could do with some extra detailing. This is the Night fighter or the two seat trainer. Messerschmitt Me 262B-1a/U1 Trumpeer 2237 Planned issue of a twoseater. One must presume it will share most parts with the singleseaters. Messerschmitt Me 410 Scracthbuilders 93004 Hornisse. Kit in Resin, Vacform and whitemetal. Inclding decals that can be ordered seperatly as 93004-01.
? A-4 (V-2) Revell 03031 Actually 1:35 scale, but my guess is that most can accept this anyway. The early Messerschmitt's are mentioned here as "Bayrishe Flugzeug Bau" Bf as Willy Messerschmitt became independent later and started using Me, but this is for later aircraft only.